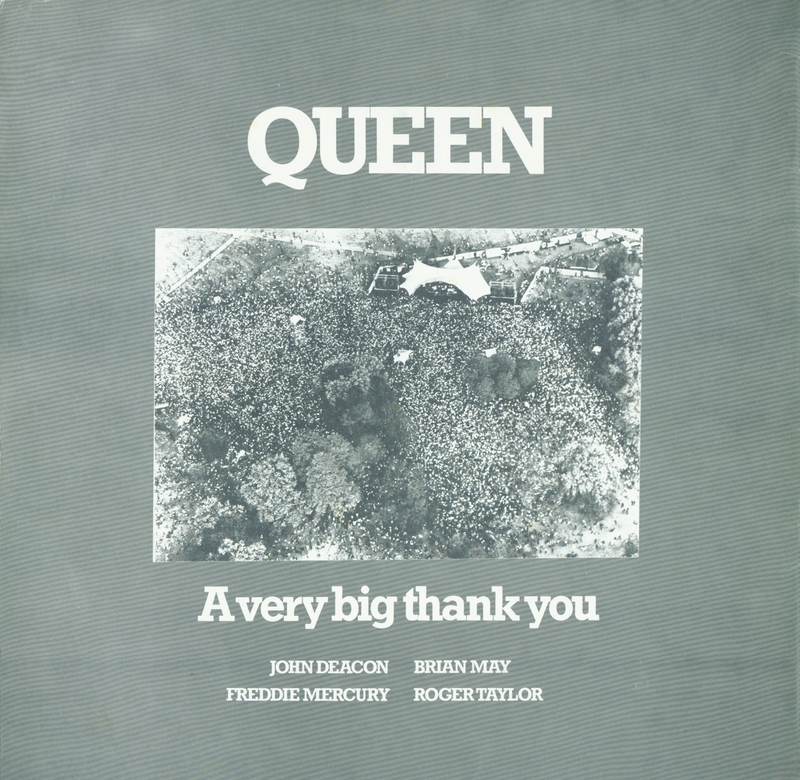 After the success of A Night At The Opera (and not to mention how the weekly Sounds readers' poll elected the band #1 in the best album, best single, and best band categories), Queen wanted to pay the British fans back for back their loyalty and support over the last few years. 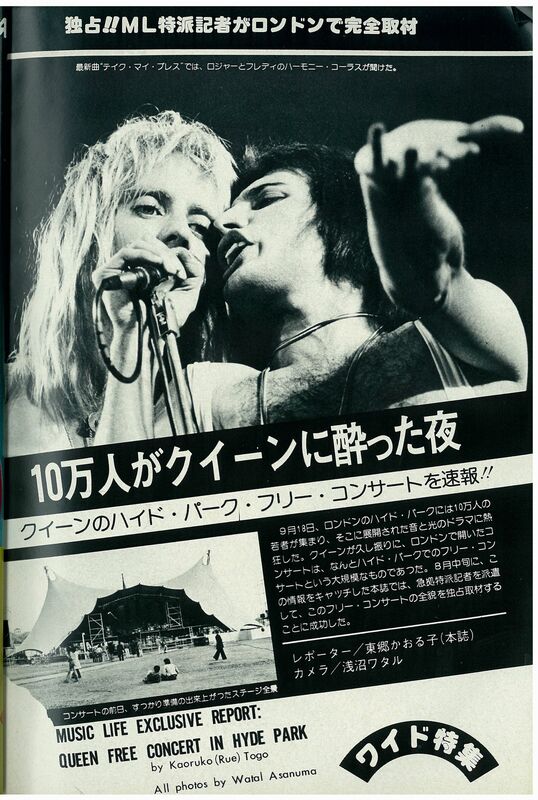 Whilst in Japan earlier in the year, they came up with the idea to stage a massive free concert. 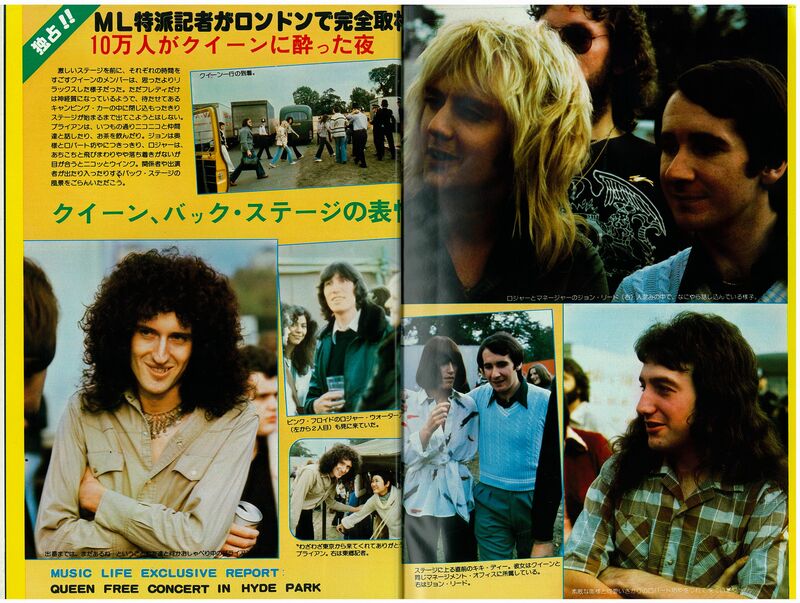 With the help of record industry entrepreneur Richard Branson (creator of Virgin Records/megastores) they started making plans for the Hyde Park show, which turned into a mini tour along with the Edinburgh and Cardiff shows. 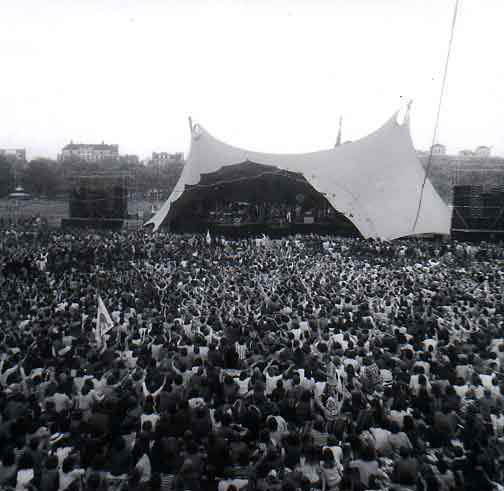 It is estimated that between 150-200 thousand people turned up at Hyde Park, which is still a record for the venue to this day. 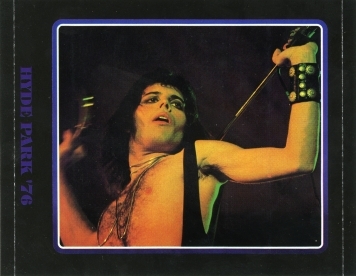 This show cemented their position in the top bracket of rock bands. 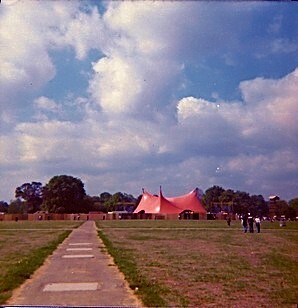 The stage used was the same stage that was constructed for the Rolling Stones concert at the Knebworth Fair a few weeks earlier. 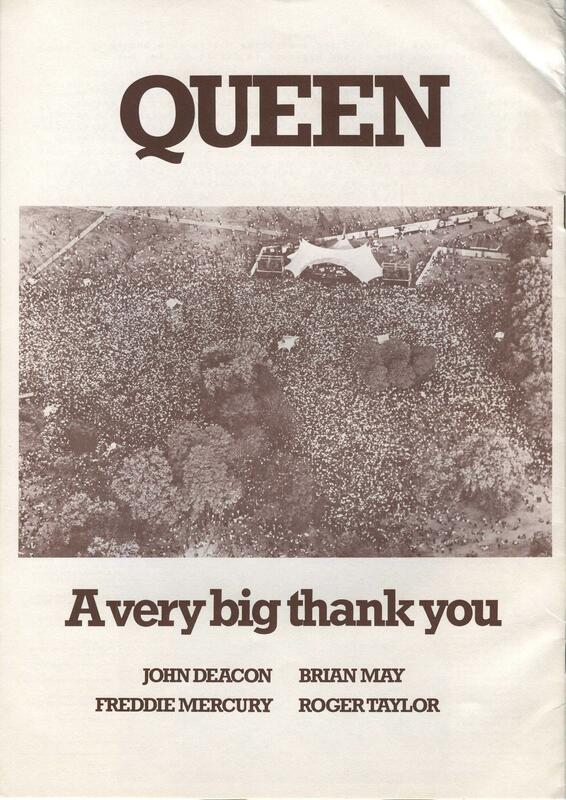 Queen's first huge show at home brought certain areas of London to a grinding halt, and space on public transportation was at a premium. 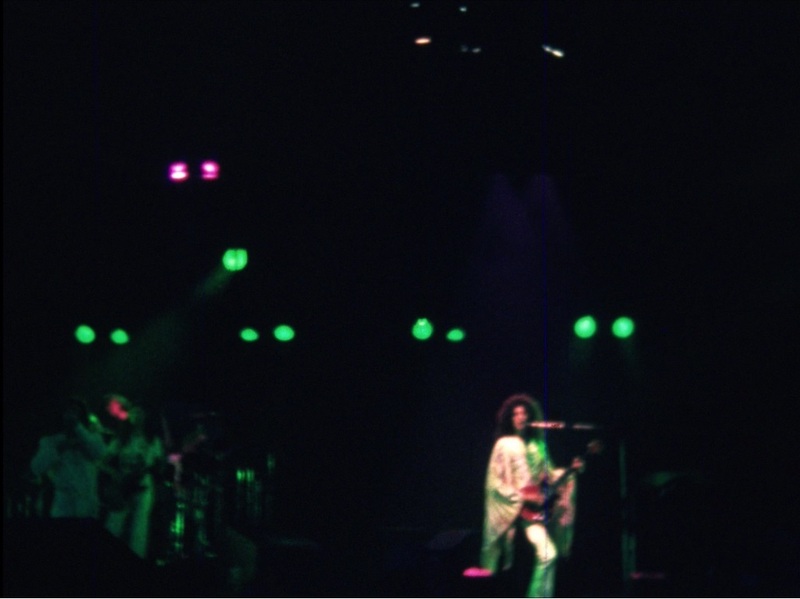 The concert took place on the anniversary of Jimi Hendrix's death. 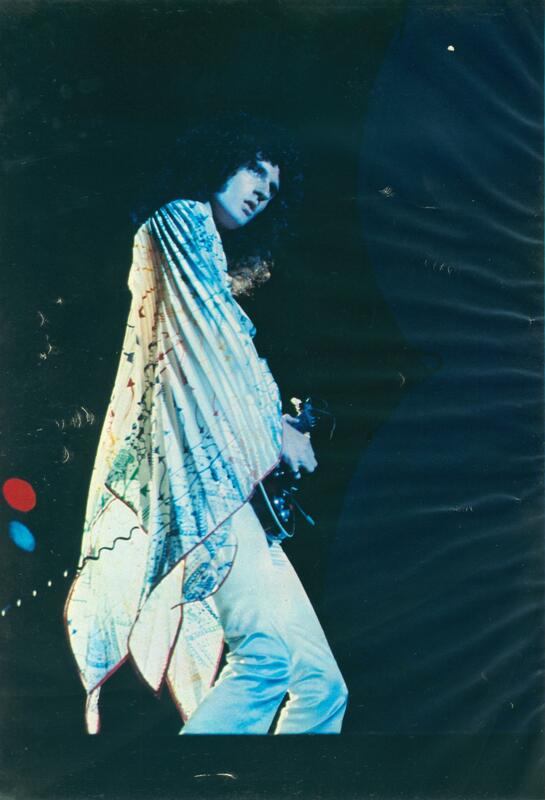 A banner hung from a tree that read "Hendrix Lives," and at one point in the show Brian May noticed it with much appreciation. 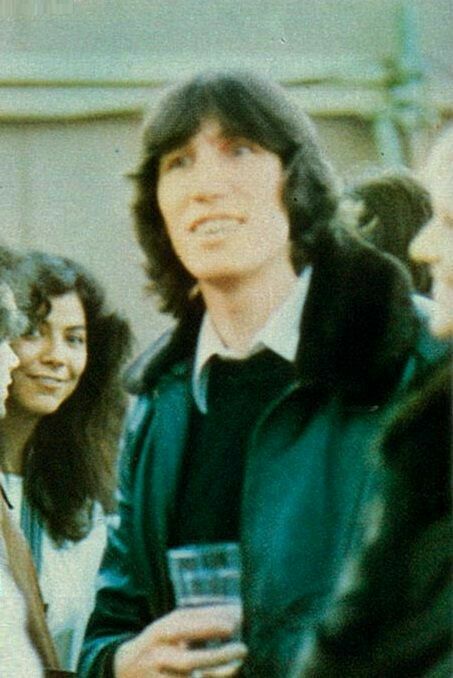 The band are seen in the photos above arriving at the venue, where they were joined backstage by Pink Floyd's Roger Waters. 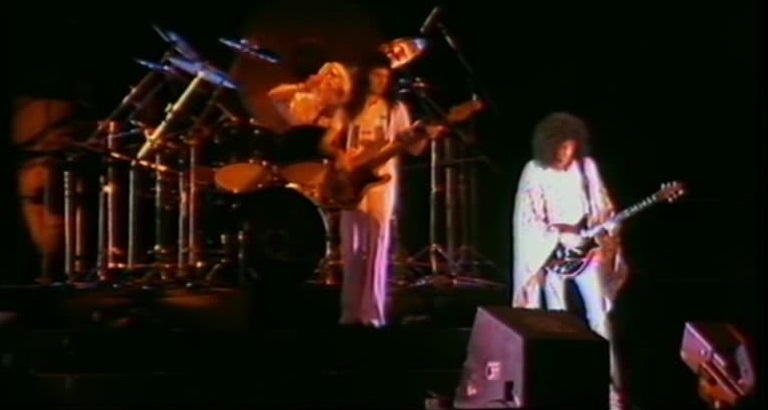 Supercharge, Steve Hillage, Rufus, and Kiki Dee (along with a cardboard cut-out of Elton John, who couldn't make it to join her for Don't Go Breaking My Heart) played before Queen. 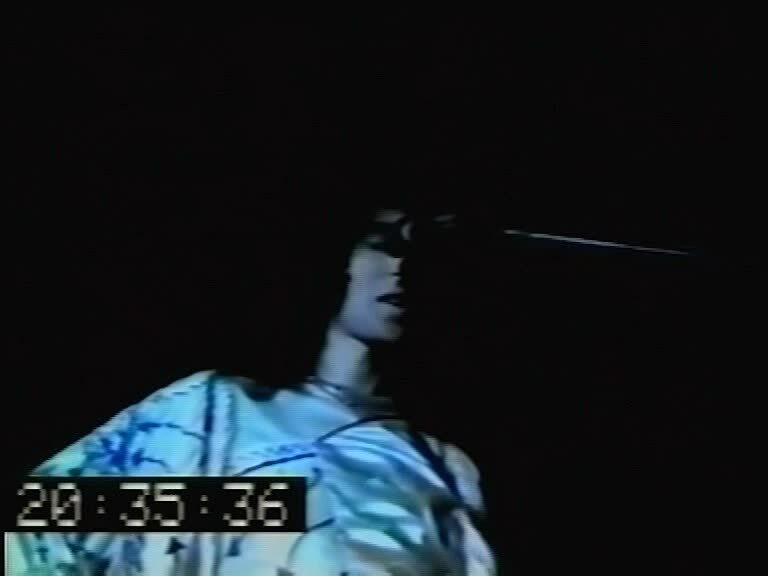 A pro-shot video of Steve Hillage's performance exists as well as Queen's. 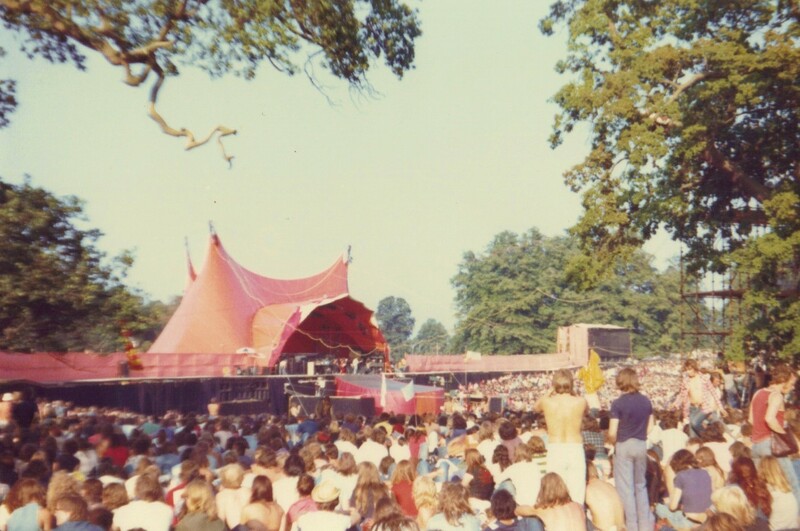 There was a fight in the audience during Hillage's set, during which he played extended trippy versions of It's All Too Much by The Beatles and Hurdy Gurdy Man by Donovan. 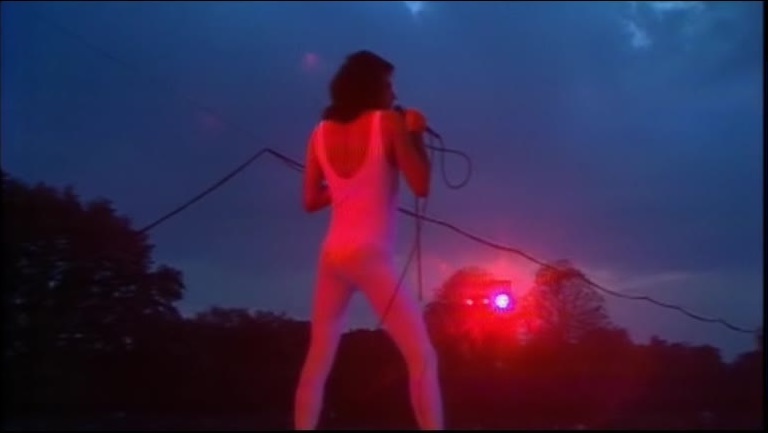 Also notable is Supercharge's singer Albie Donnelly parodying Freddie Mercury in a white leotard and a half mic stand. 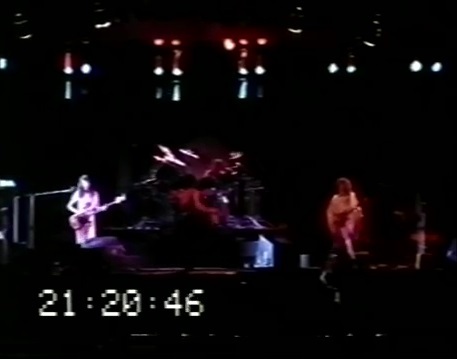 The first half of the A Day At The Races overture is aired publicly for the first time (the upcoming album had been partially recorded by this point). The usual Bohemian Rhapsody opening sequence then commences for the last time. 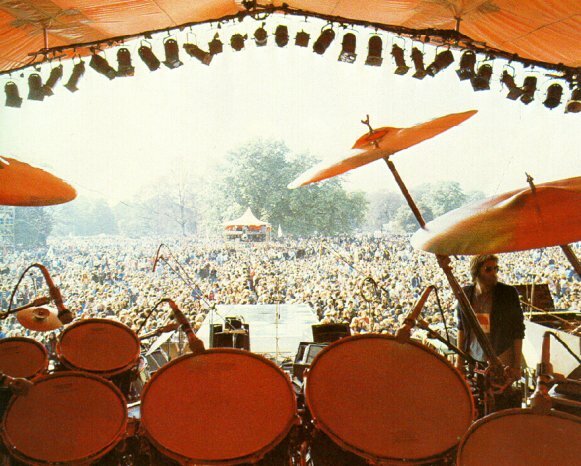 The band make their entrance, and everybody near the stage stands up (the audience had been seated on the grass for the opening acts). 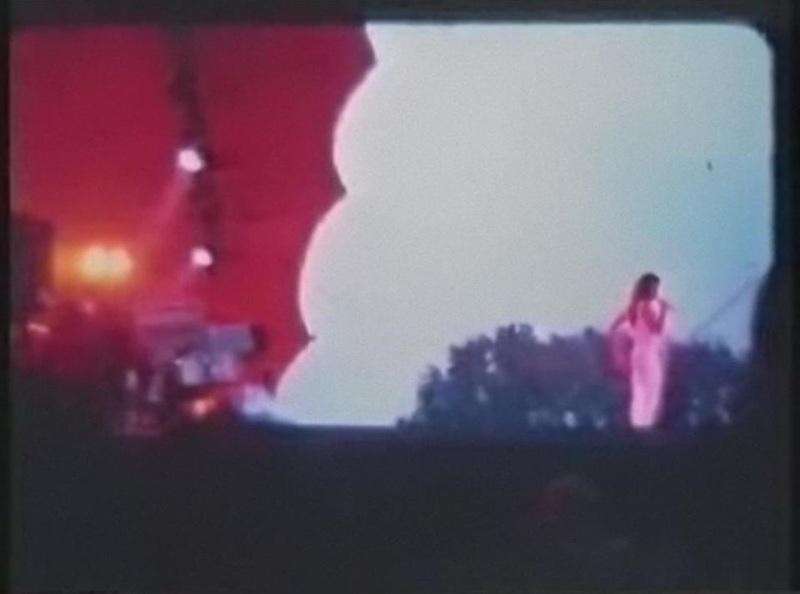 This angers many fans who are further back (roughly 90% of the audience now cannot see the stage), so they start lobbing cans, bottles, or whatever else that can be thrown. 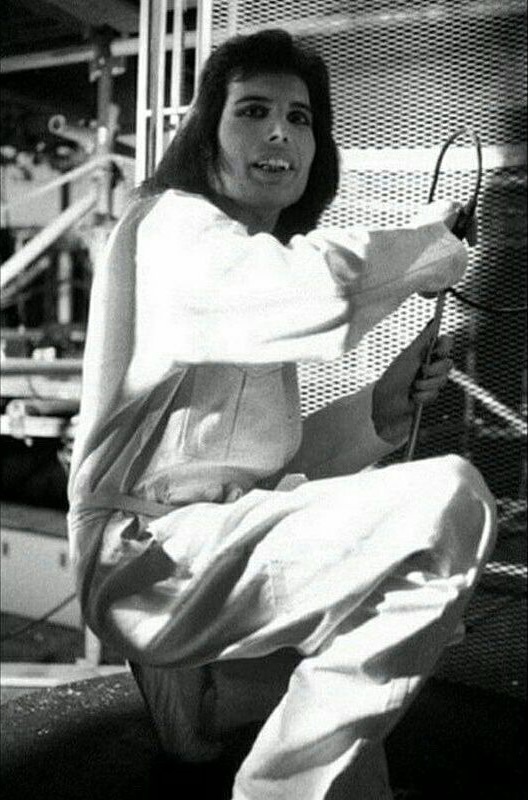 After a few songs, Freddie asks everyone simply to calm down: "I have been requested by the constabulary for you not to throw little things around, tin cans or whatever. So make this a peaceful event, ok? Sit on your arses and listen." 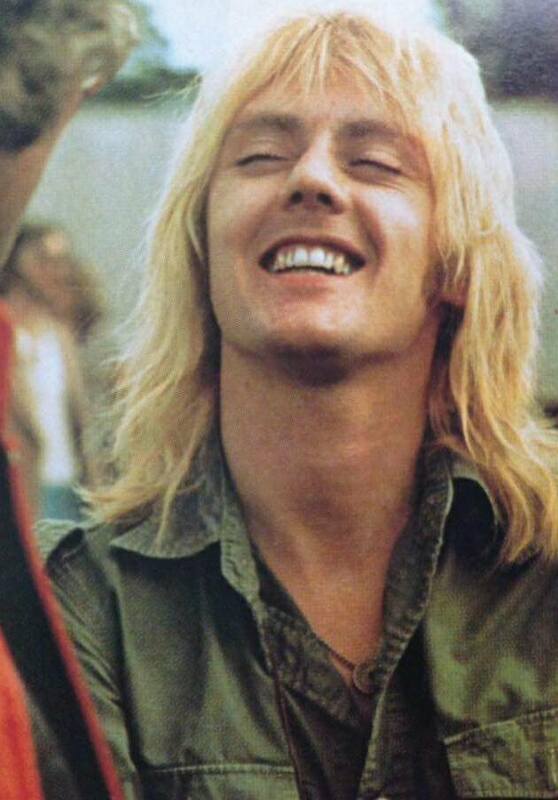 Brian, after his solo spot in Brighton Rock (he stutters a bit, revealing that he's still nervous): �From one piece of nonsense to another, I�ve said it before. This is something we wanted to do with the London Philharmonic but they didn�t show up, so we will do the ethnic version of a song called '39." 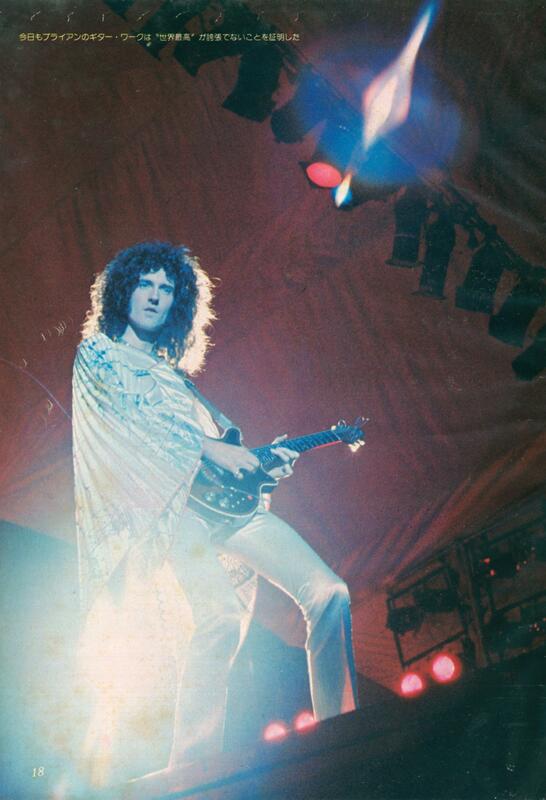 He is seen in a dazzling new outfit tonight, which he'd wear every night through Japan 1979. 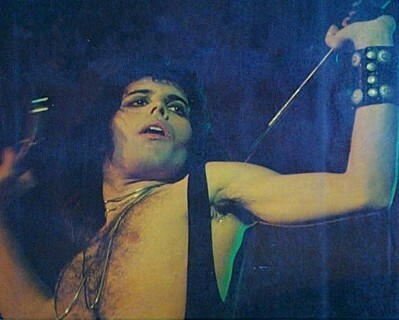 It would become the outfit he'd change into during the opera section of Bohemian Rhapsody. "Clap along and stuff," he urges the audience, as he plays the intro of what he'd later describe as the first song about Einstein's general theory of relativity. 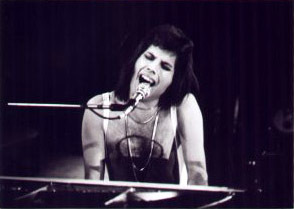 After '39, Freddie audaciously performs the as-of-yet unreleased You Take My Breath Away alone on the piano, even hitting many of the falsetto notes that he'd excise in 1977 versions. 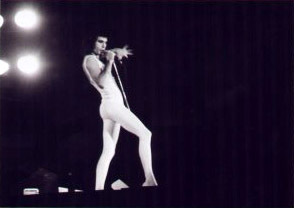 He then gets cheeky and introduces The Prophet's Song as "a little shorter number from our album A Night At The Opera." 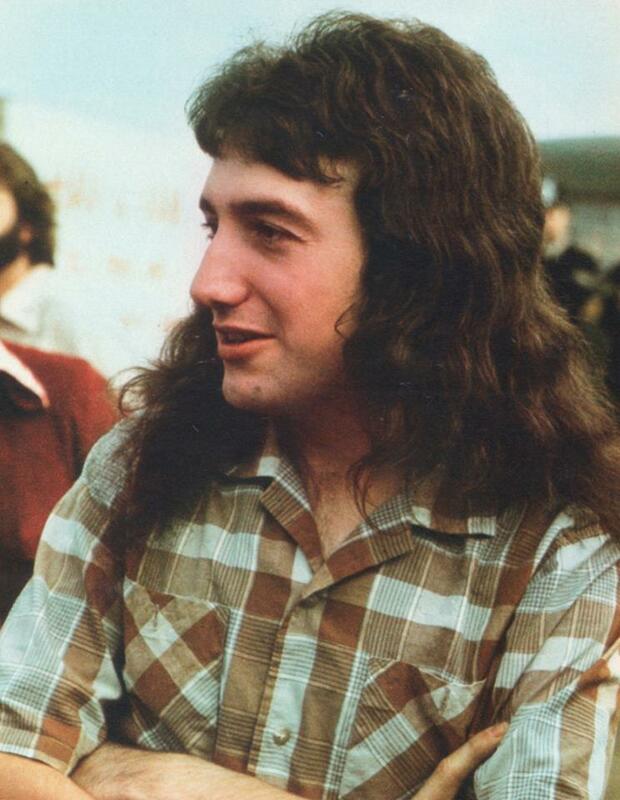 Perhaps he still had You Take My Breath Away in his head, as he begins the a cappella section with what would become the first line of the A Day At The Races ballad instead of the usual "oh, people can you hear me?" bit. He also references Death On Two Legs, as he had done a few times earlier in the year. 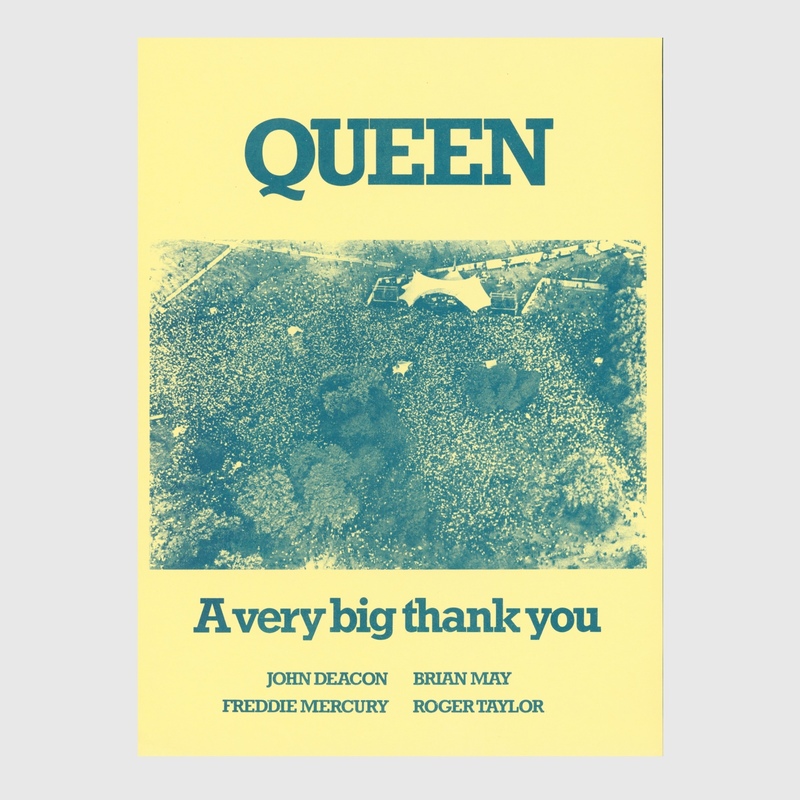 After Stone Cold Crazy, the band play Keep Yourself Alive and Liar, having dropped Doing All Right and Lazing On A Sunday Afternoon from the set. The combination of these three heavy numbers would prove to be very effective, and they would stick with it for their following North American tour. Liar is a great version, with many great Mercuryisms throughout. Before the last song, Brian coyly says, "This is In The Lap Of The Gods, or something like that." The band play a similar set to the ones they did in Edinburgh and Cardiff, except they drop Doing All Right, Lazing On A Sunday Afternoon and Tie Your Mother Down. They intended to perform their usual encore of Big Spender and Jailhouse Rock, but the show had run a half hour past its scheduled ending time (a curfew strictly enforced by the authorities). 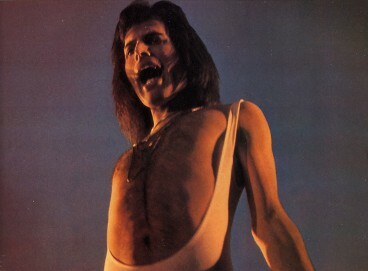 The police threatened to arrest the band if they went back on stage, and Freddie was later quoted saying how he would prefer not to be stuck in a jail cell in his leotard. 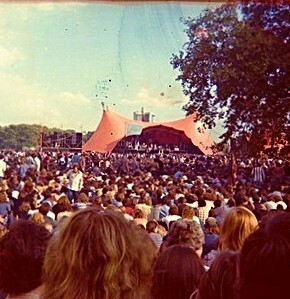 And so, Bob Harris was left with the unenviable task of announcing to the crowd that the show was over. 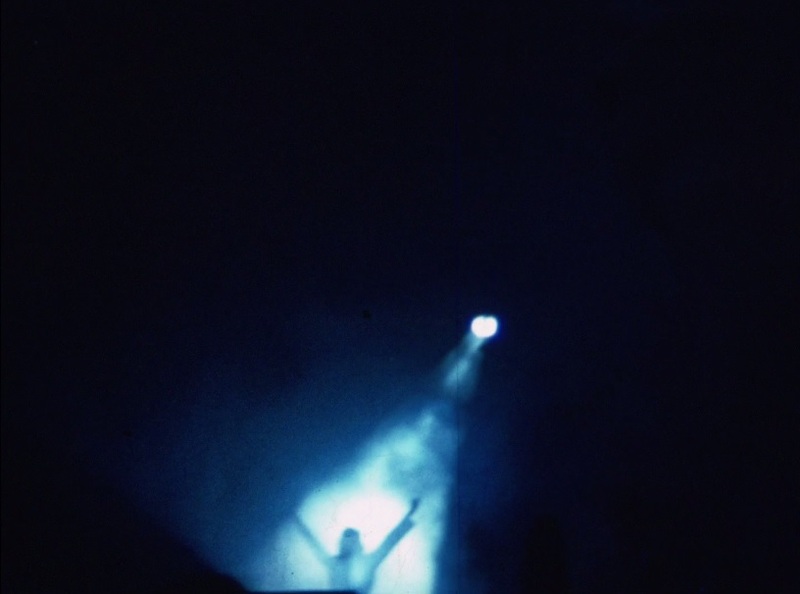 He later recalled how difficult and nerve-wracking it was to tell an audience of this size who had waited for about ten hours that there would be no encore. Now I'm Here was the first encore every night around this time, making this the one time between 1974 and 1986 where the song is not performed. The liner notes of Live Killers suggest that Now I'm Here was dropped from the set for a while, but that is patently untrue. People in one section of the audience chanted "Why are we waiting," all in good fun, knowing full well the show was over. The police soon turned off the main power feed to the park, forcing hundreds of thousands of people to make their way out in sheer darkness. Their reasoning was that it was the only way to "control" such a large number of people who had been rowdy throughout the day. 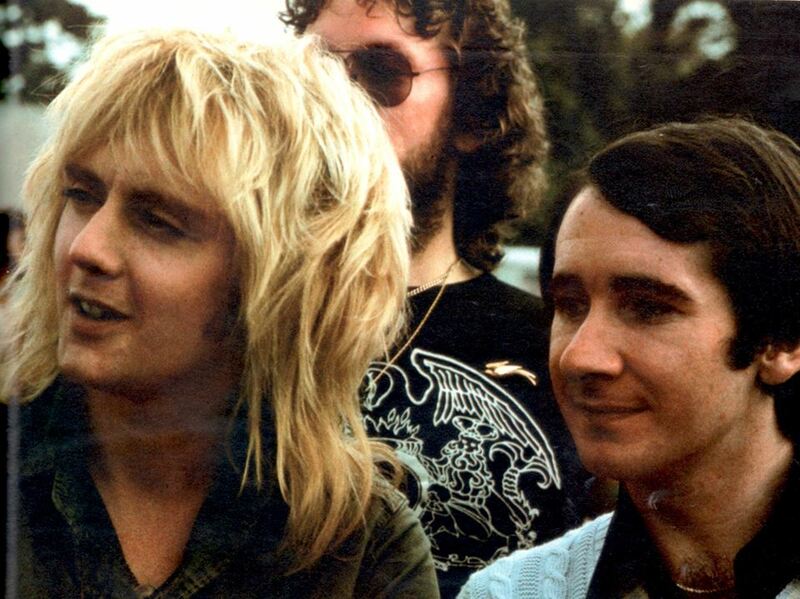 In a 1977 interview with Capital Radio, Brian recalls the day: "It had a great sunny day for it, and everyone had a good time. 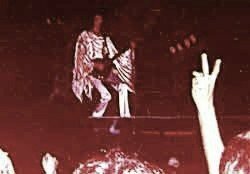 There were still altercations on the day, and there was a big thing with the powers that be because they wouldn't let us go on and do the encore, about which we were very upset, having worked up for months and prepared for all that. 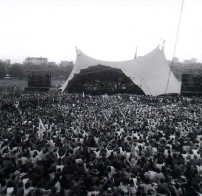 They got very frightened because there were 150,000 people in Hyde Park in the dark, and they thought they were going to get out of hand. But in fact, there was no possible danger happening at all. 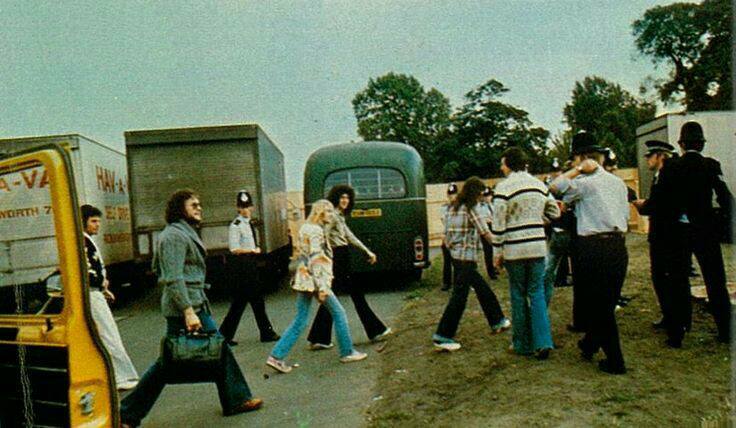 Everyone was peaceful and having a good time." 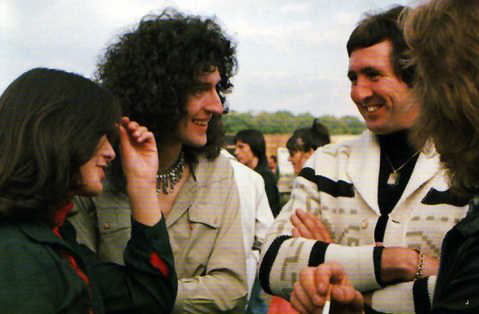 This show is what epitomized their popularity in Britain, and when they felt they "had really made it," as Brian would later recall. 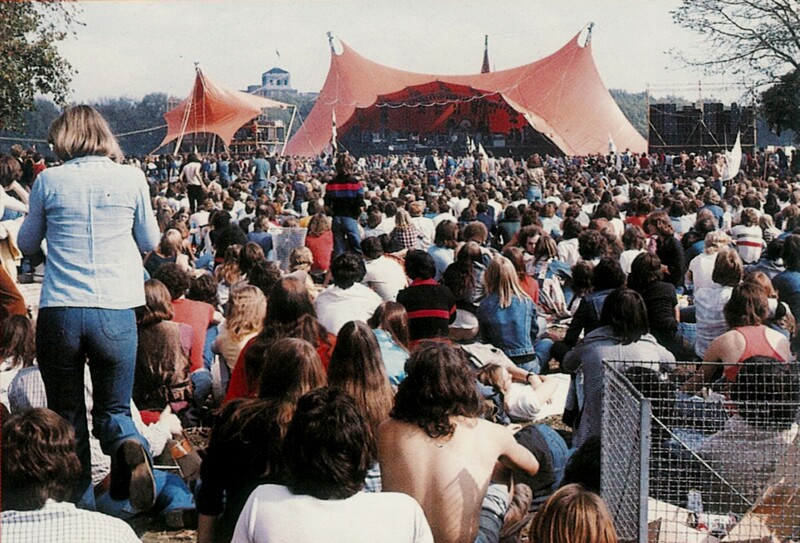 On another occasion he said, "I think that Hyde Park was one of the most significant gigs in our career. There was a great affection because we'd kind of made it in a lot of countries by that time, but England was still, you know, we weren't really sure if we were really acceptable here. So it was a wonderful feeling to come back and see that crowd and get that response." 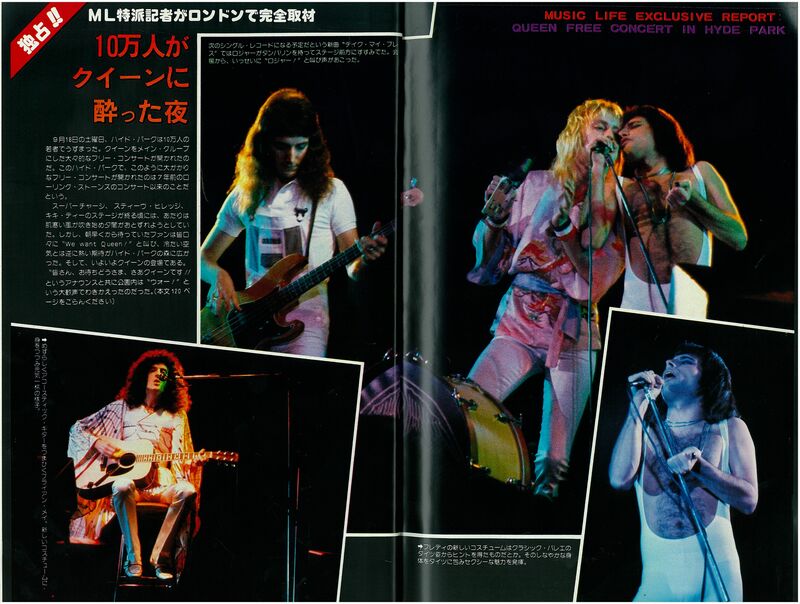 Despite the fact that the audience had been there all day watching the various opening acts and waiting, the band delayed the show as long as possible just so it could get dark enough for their lighting and various other effects to make their full impact (as demanded by Freddie). 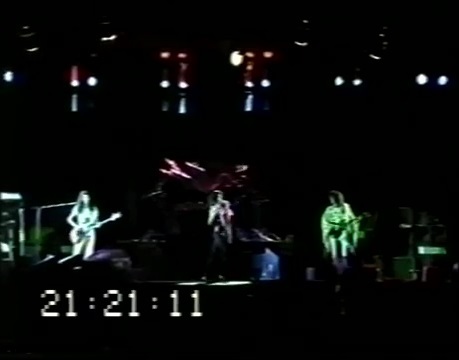 Throughout the show, the band's nervousness and excitement for the occasion are evident. 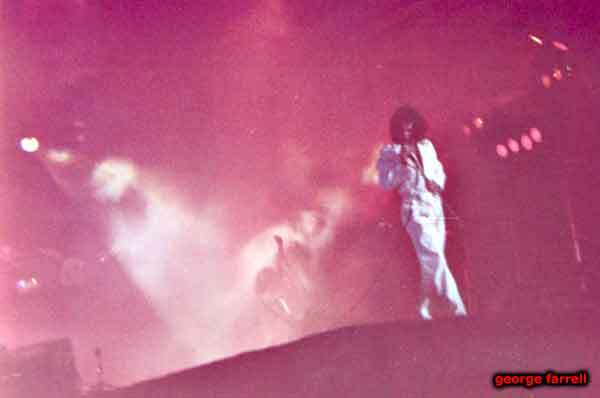 Most of the audience couldn't see a thing during Queen's set, since the stage was barely elevated. 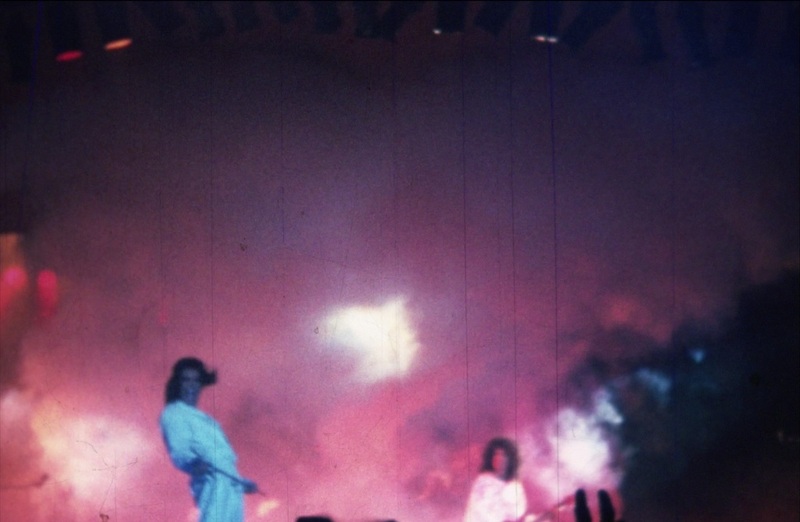 "The smell of the dry ice and the sound are the only sensory memories I have of this show," recalls Jane Palm-Gold. Tonight would be the final performances of Flick Of The Wrist, Son And Daughter, and the (almost) full The Prophet's Song. 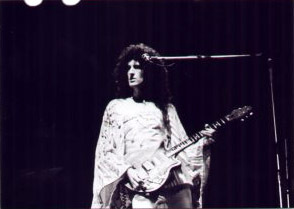 A snippet of The March Of The Black Queen would be performed only once more in 1978, but a different part of the song. 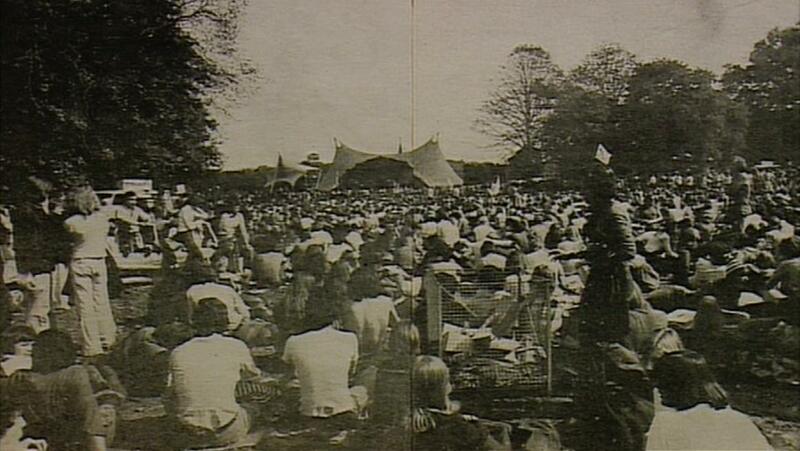 This show was recorded by Capital Radio, but never broadcast (although some claim to have heard it). 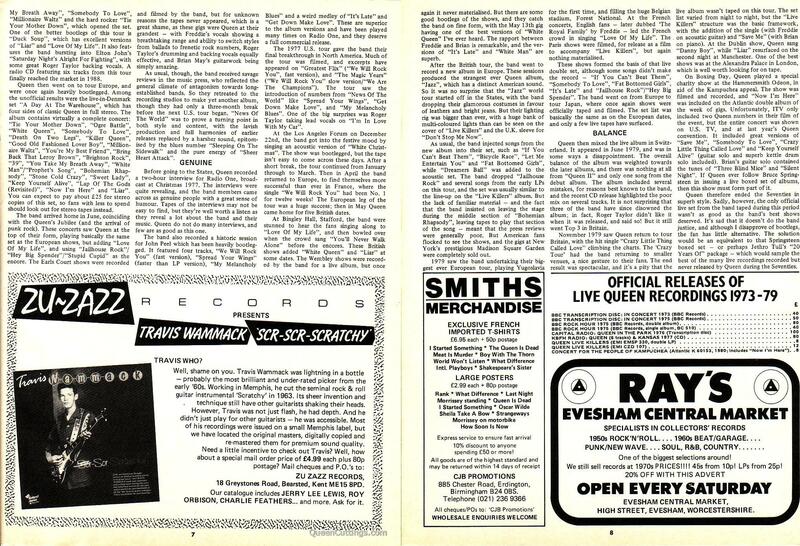 A Capital Radio transcription disc allegedly exists, according to this article from the June 1989 issue of Record Collector. 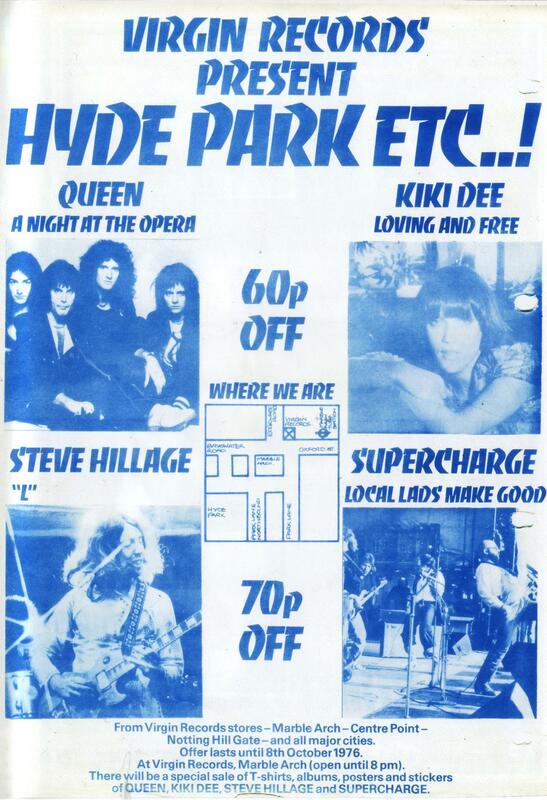 In the autumn '76 fan club magazine, Roger Taylor wrote, "There should be a film of the Hyde Park show on TV soon," but it was never shown in its entirety. Only one song, Sweet Lady, was shown on British TV (the Old Grey Whistle Test) on December 14, along with an interview with Brian May by Bob Harris. 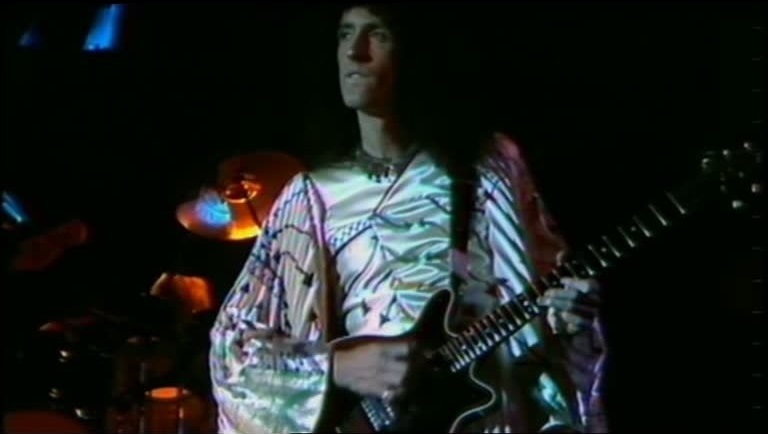 This superb (and perhaps definitive) performance of the song was also broadcast on US TV, on Don Kirshner's "Rock Concert" on February 8, 1977 (along with the promo video of Somebody To Love, which also contained some Hyde Park footage). 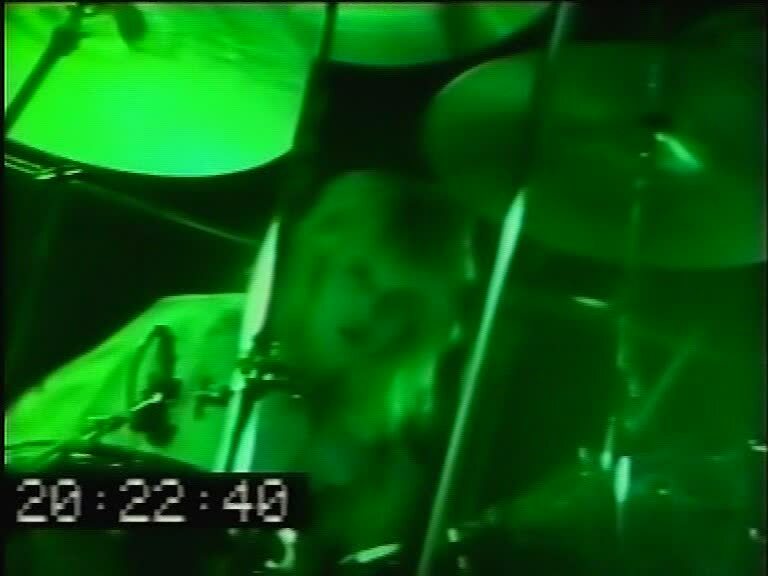 Some of Sweet Lady was also shown on a 1979 US TV documentary called "The Champions" (the tape noticeably played a bit slowly). 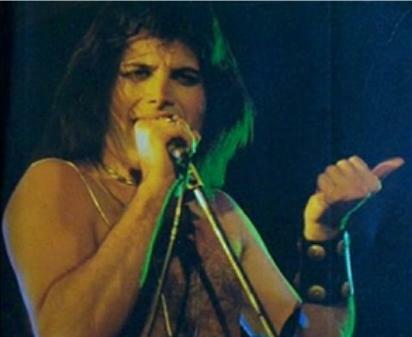 It was eventually included on the A Night At The Opera 30th anniversary DVD, along with clips of Bohemian Rhapsody and The Prophet's Song. 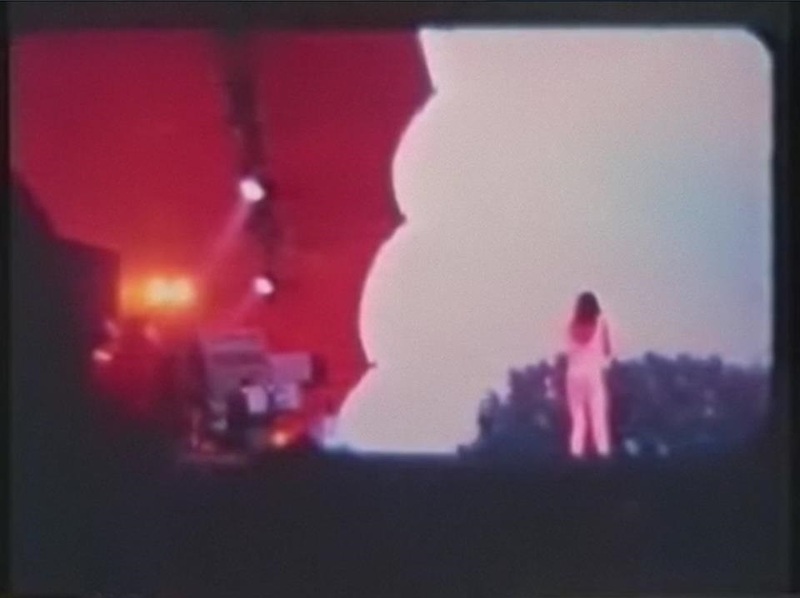 The complete pro-shot video eventually leaked to collectors. 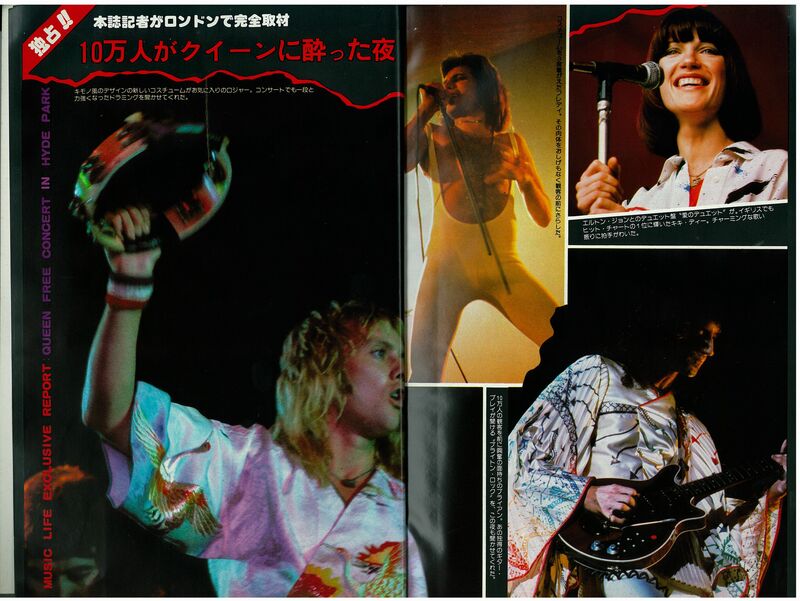 It has also been shown at fan conventions, and clips (usually of Flick Of The Wrist, '39 or Keep Yourself Alive) have shown up in many documentaries, particularly "The Magic Years" released on VHS in 1987, and the 1995 "Champions Of The World" VHS. 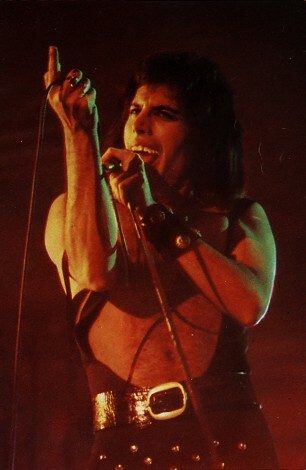 In 2001, Jacky Smith, the head of the Queen fan club, said, "The quality is very very bad and they cannot 'rescue' it as it was filmed on 16mm and not stored properly." While the segments from the aforementioned DVD are in excellent quality, this doesn't necessarily mean all the footage has survived. And it should be noted that the footage was shot on video and stored on 16mm film. 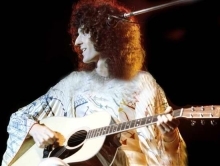 In March 2009, BBC radio 2 broadcast an informative program called "Wish You Were There," including interviews with Bob Harris and Peter "Ratty" Hince (one of Queen's roadies), as well as people who attended the show. 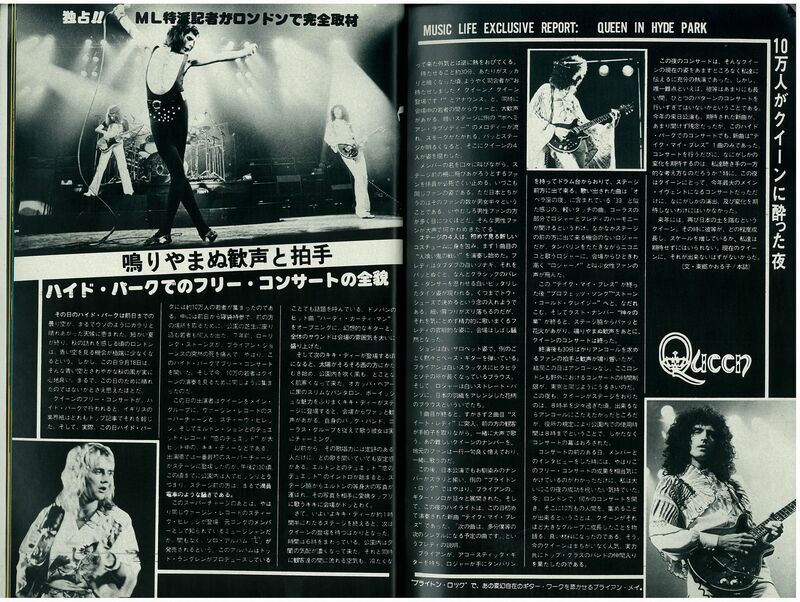 Queen's set as well as the opening acts were among the things discussed about the ground-breaking concert. 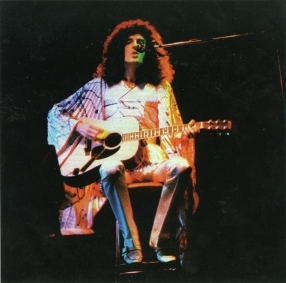 Parts of the first couple songs of the show were shown at the "Stormtroopers in Stilettoes" Queen exhibition in London in early 2011, in better audio (although mono) and video quality than ever before. 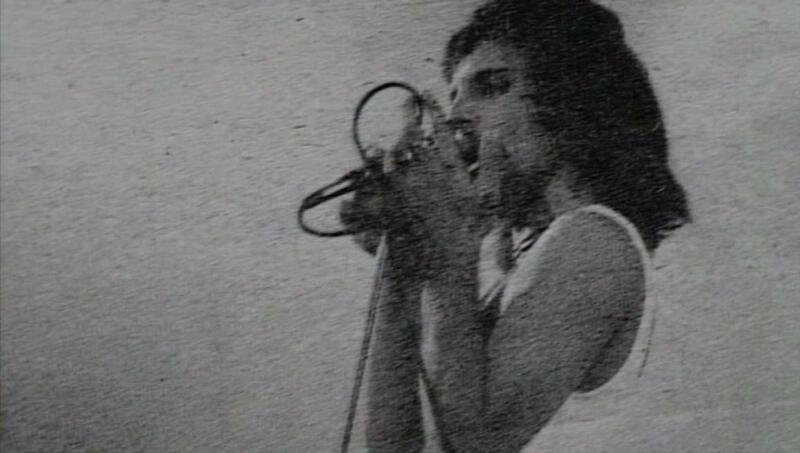 Clips of the songs were also seen in the 2011 documentary "Days Of Our Lives" aired on BBC Two. 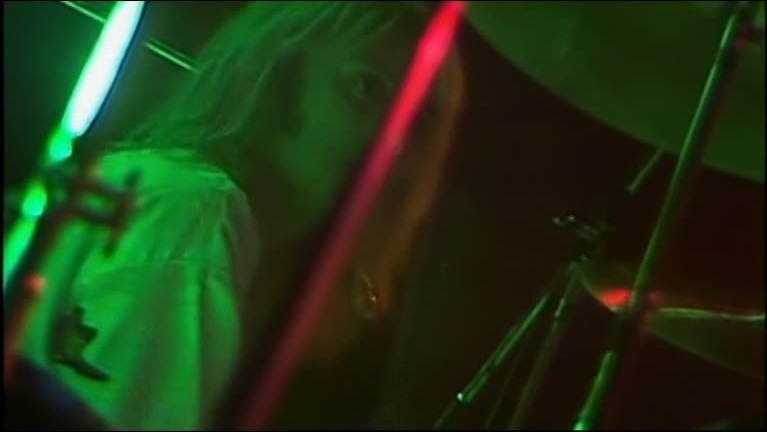 The Bohemian Rhapsody clip was notably of Freddie's first line ("So you think you can stone me and spit in my eye"), a line in which Freddie is mute due to technical/audio issues on the average quality pro shot footage video mentioned above. Perhaps this inclusion was no accident. 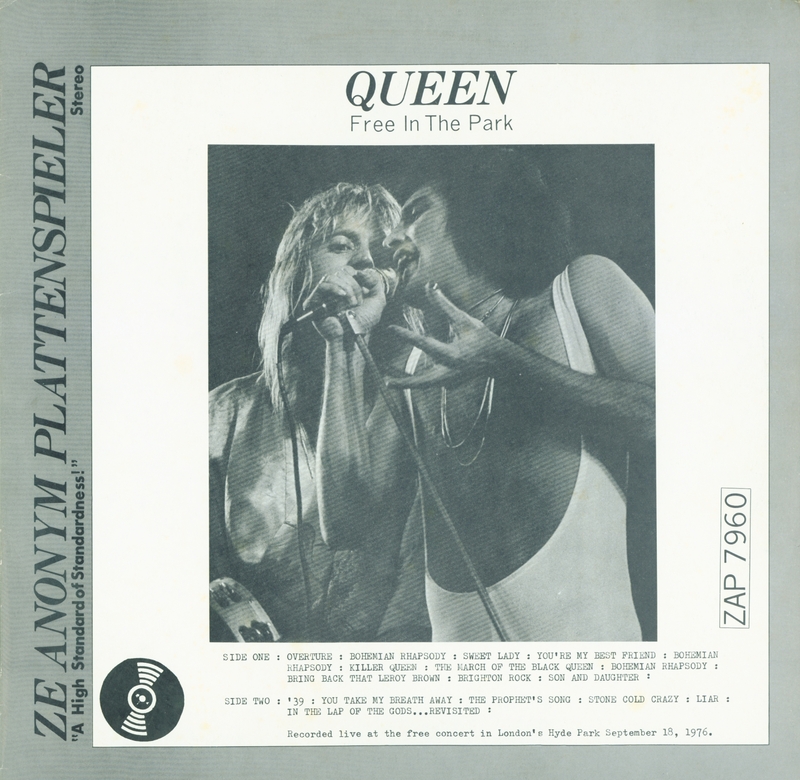 The Hyde Park version of You Take My Breath Away was released as a bonus track on the 2011 remaster of A Day At The Races. Part of You're My Best Friend was seen in a 2015 BBC documentary called "From Rags To Rhapsody." 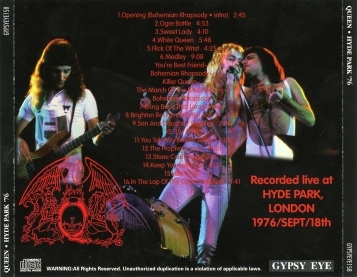 As with most recent broadcasts of the Hyde Park material, both the audio and video quality are excellent. 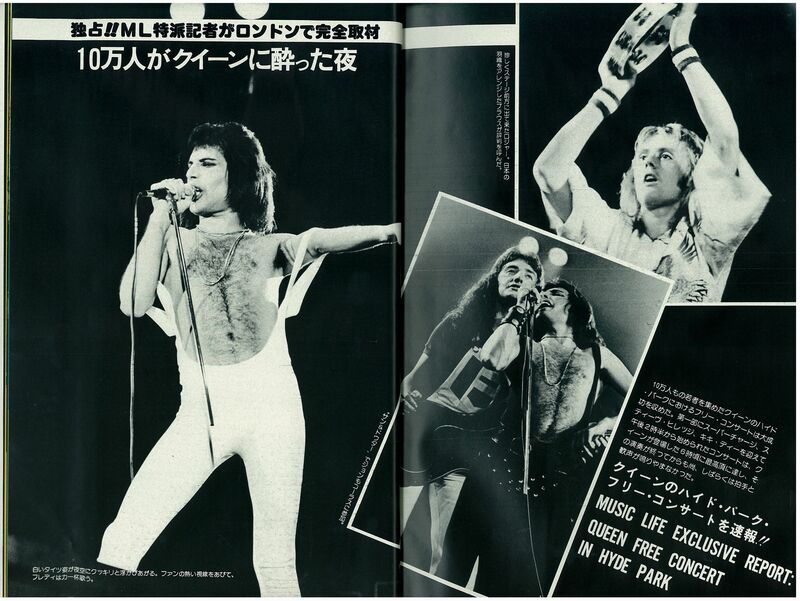 The thirteenth pic is the famous overhead shot that appeared in the October 9, 1976 Melody Maker. Pics 3 and 16 were submitted by Janneman, and pics 17 and 18 were submitted by Luk� Bos�k. 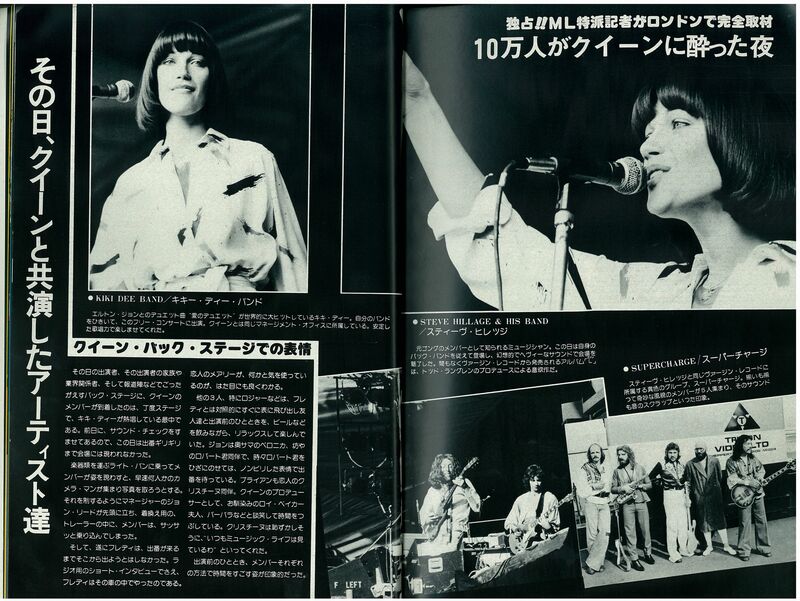 Pics 20 and 21 were taken by Hiro Ohno. 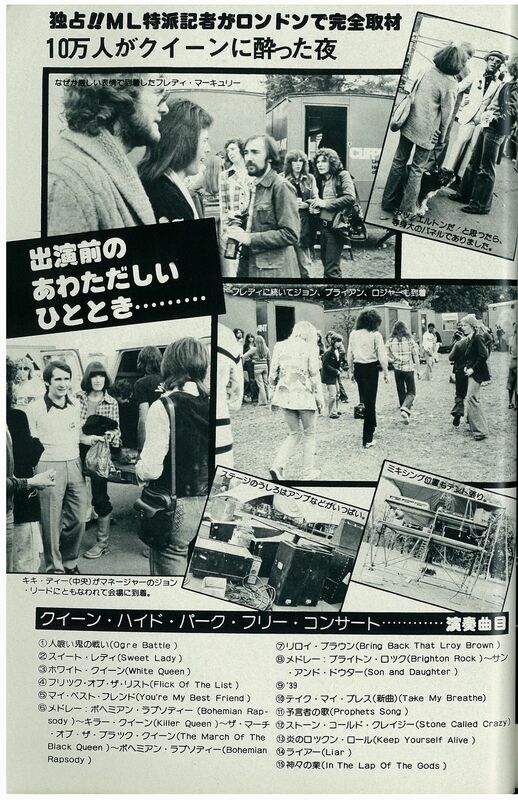 And a Virgin Records flyer. This is the pro shot video of the virtually complete show. 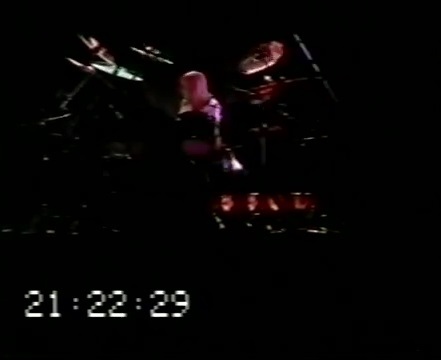 The video quality is good, but the audio mix is poor, even on the best copies. 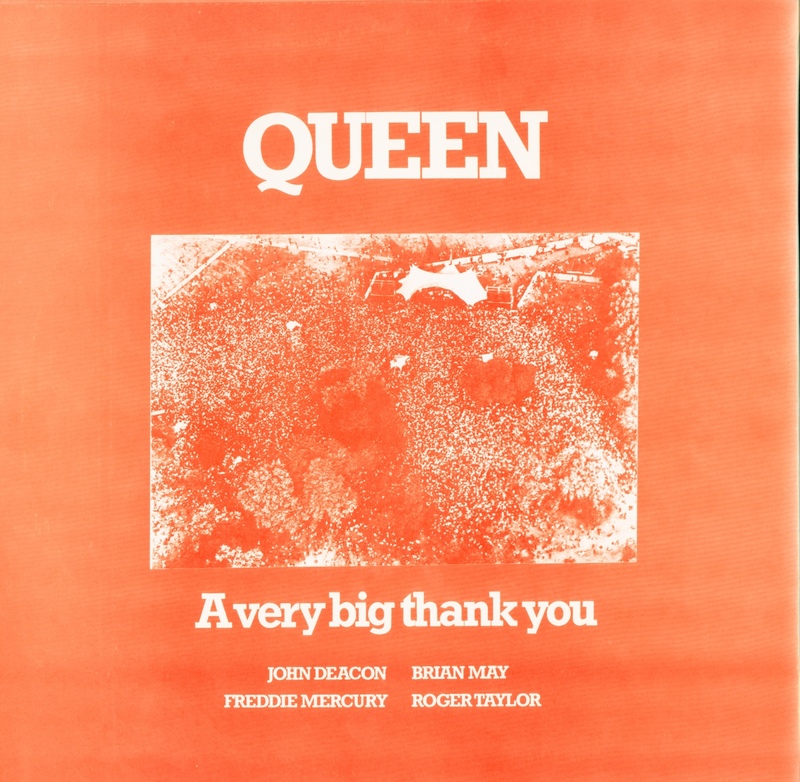 The sound (particularly Freddie's voice and piano) has an odd fluttering effect throughout, the drums and Roger's backing vocal are buried, and there is much tape hiss. 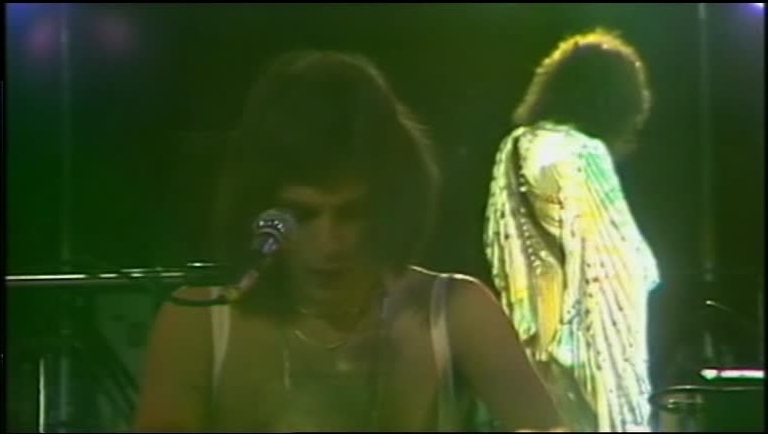 An uncut distant single camera shot also exists, including the missing bit of Keep Yourself Alive. The audio is still the same muffled soundtrack. 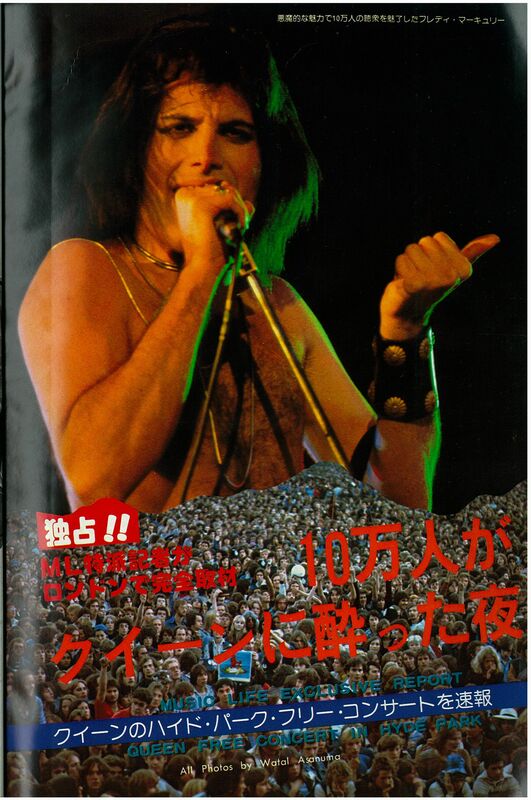 Three songs were seen on the A Night At The Opera 30th anniversary DVD. The quality is pristine, although unfortunately cropped to 16:9. 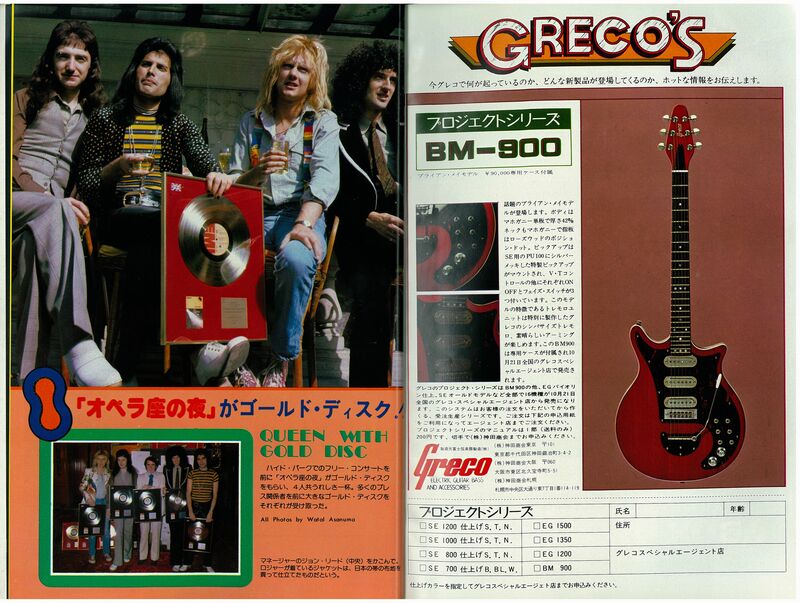 This Japanese bootleg LP released in 1976 is from an audience recording. It was taped off to one side of the stage, as only one echo of Brian's Brighton Rock solo is heard and is the most prominent. 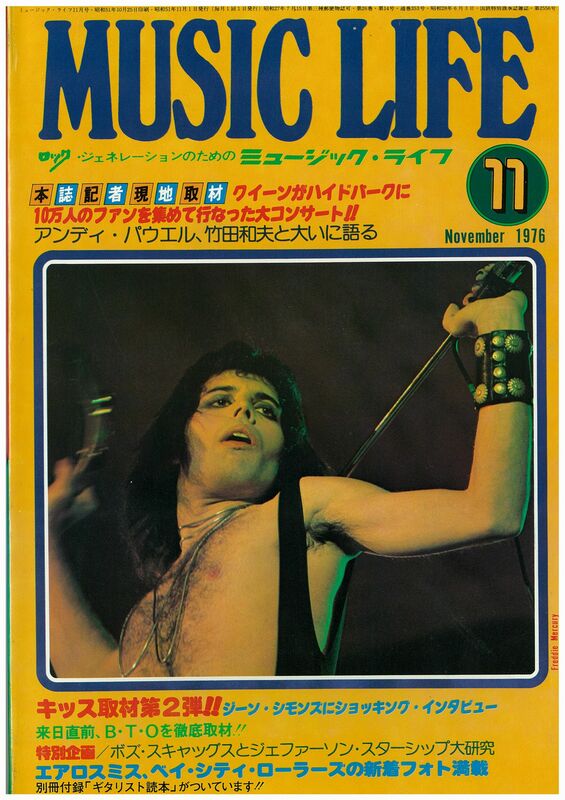 Four songs are missing (Ogre Battle, White Queen, Flick Of The Wrist and Keep Yourself Alive), as the show was squeezed onto a single LP. It's possible that Ogre Battle and White Queen were omitted because of all the ruckus in the audience, with people being hit by projectiles thrown in the crowd. Although the quality fluctuates (there is distortion in some of the louder spots), it is often quite good. The mix is better than the video soundtrack, as all the vocals are mostly well-balanced. There is another version of this LP (apparently an earlier version, a Japanese bootleg acetate) which sounds even better. 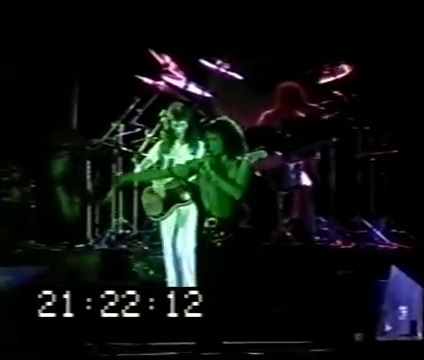 The existence of the audience recording debunks the myth that Freddie's delay during The Prophet's Song died at the Hyde Park show. It most certainly was working, as it is clearly heard here. It was simply a soundboard mixing issue, as the video feed didn't pick it up at full volume (it can be very faintly heard on the video). 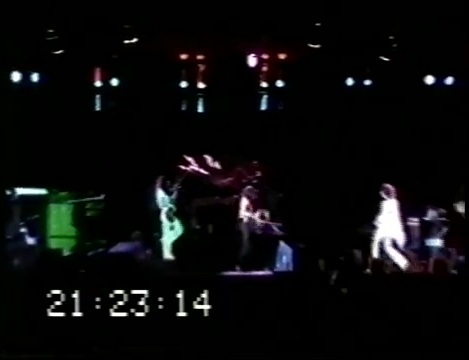 Also, Freddie's first line of the Bohemian Rhapsody rock section isn't heard on the video feed, but it was heard by the audience as confirmed by this recording. Also, this audience recording reveals that the crowd wasn't listening nearly as intently to You Take My Breath Away as history would like to record. 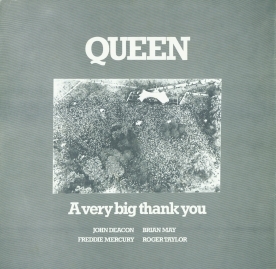 People were shouting throughout the entire song, although it's worth noting that the people heard most clearly on this recording are pretty far away from the stage, as it sounds distant. At one point in the song, a large group of people repeatedly chant "sit down" followed by hand claps, almost like a football match. 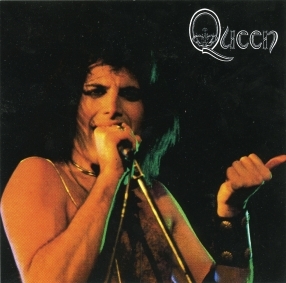 A second pressing of the LP was released later in 1976. 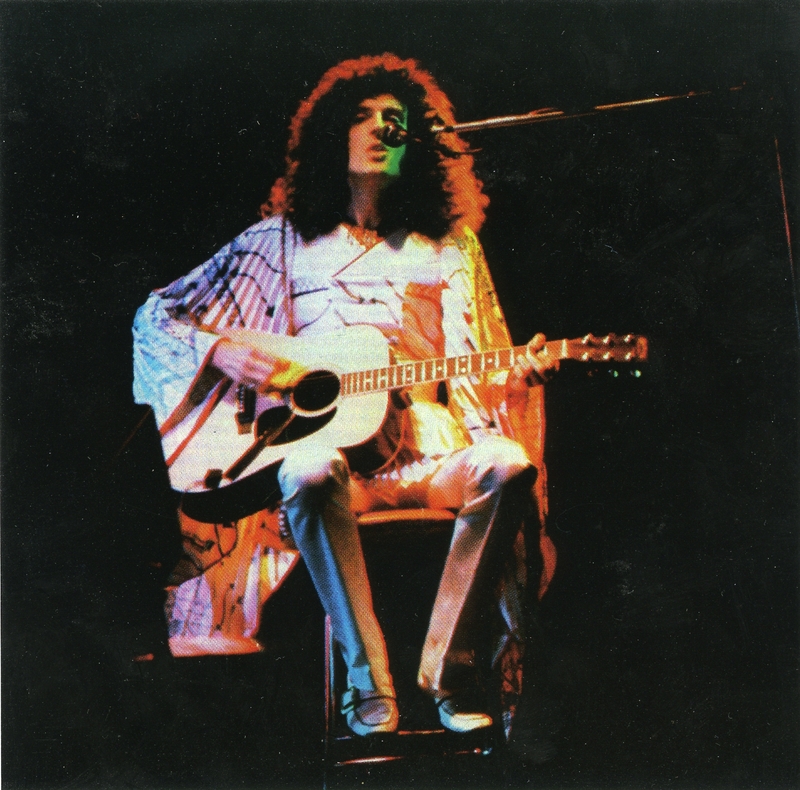 A third pressing came out in 1977 in a bit worse quality. This is the uncut audience source, although a mono transfer of it. It's complete except for a bit of Stone Cold Crazy that was cut for a tape flip. This is from a higher generation tape, so technically it shouldn't be referred to as a pre-LP. 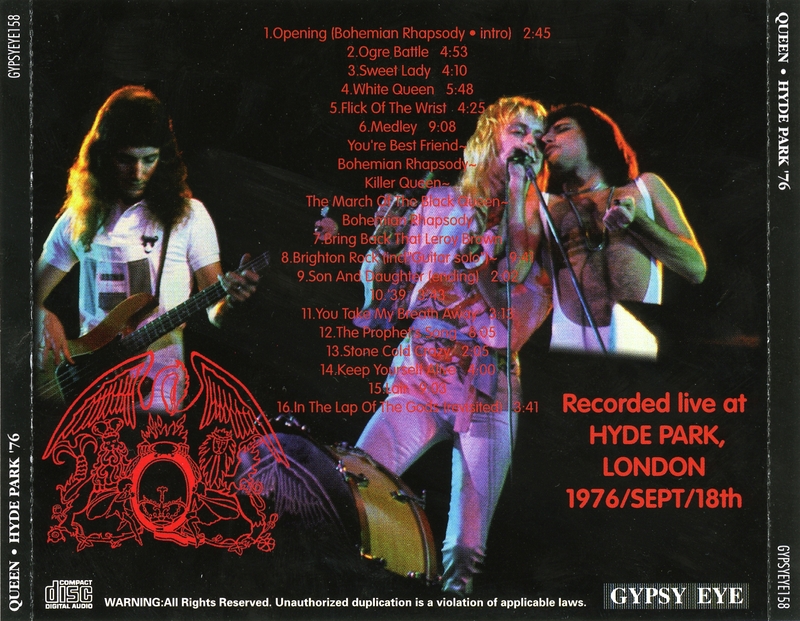 Either way, it's currently the best available document of the (nearly) complete Hyde Park show. This second audience source from Hyde Park is pretty poor quality (it sounds like the cassette recorder was in the taper's pocket). Some of the speeches before songs are cut. This is taken from the video feed, but it's still not at all great by most standards. As explained above, the many flaws of this video feed are not an indication of what was heard from the audience or what was recorded from the soundboard. Although it is musically complete, Gypsy Eye didn't include Bob Harris' speech at the end of the show. 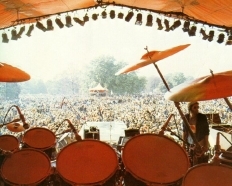 A single reel of 8mm footage from Hyde Park exists. About 2 1/2 minutes are of Queen, along with bits of opening acts Steve Hillage and Kiki Dee. A second 8mm source from this show exists.